The new Mini Covert is the newest member of Gerber's Applegate-Fairbairn folding knife family. Designed by Bill Harsey, the Mini Covert is a scaled down version of the original Applegate-Fairbairn Covert. Inspired by the original design by former OSS officer, Col. Rex Applegate, with over 40 years of knife design experience and legendary in the world of knife design and hand-to-hand combat. The Mini Covert has a blade length of 2.94 inches, making it the perfect size to clip to your pocket. 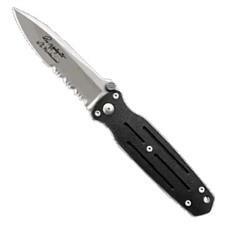 The Mini Covert is available in single edge with a partially serrated blade. There is an opening stud on both sides of the blade, making the knife perfect for one-handed opening with either the right or left hand.